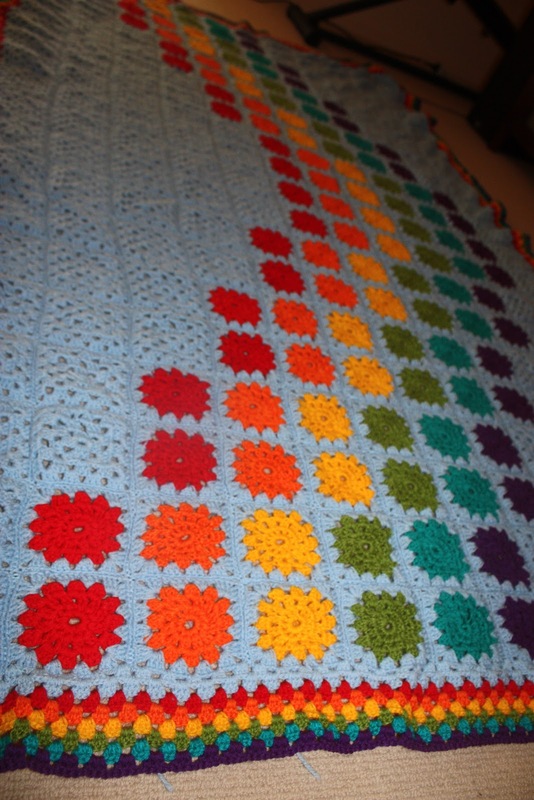 I cannot believe it - My Rainbow Crochet Blanket is finished. Just in time too - as it's being used today to keep little Minnie warm while he is home feeling *ugg* on the lounge. He didn't want to be in any photos, which is a sure sign he really is quite *ugg*, so I asked if I could borrow it for a few quick photos to share. 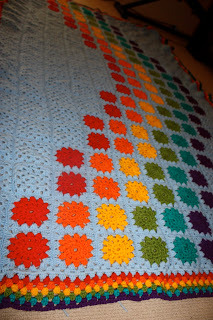 I just love it, I just love that I finished it and it's being used right now to snuggle my darling boy. I love that I can share this with you. I love that he loves the colours, I love that I have enough yarn left over to do a cushion cover, I love that this room in our house is going to be a rainbow room through all of winter, I love that I am about to curl up with my boy under this very blanket while he gets better and I make notes for my next assignment and prep playgroup craft sessions. I love that my Grandma, my Nanna, and my Mum took the time to pass on their love of craft to me. For more creative spaces, pop on over to kootoyoo. Thank you so much for stopping by my place today. Have a wonderful day at your place. love your bright rainbow colours!!!!! Looks beautiful! Your little man will surely feel better faster wrapped in that lovely rainbow blanket, made by mummy. It turned out great, Well done!!! That looks amazing! I would so loved to be able to crochet. I have been trying to teach myself for so long but keep getting frustrated and throwing in the towel. i just love it - great pattern - may i ask, is your header photo taken in Sawtell NSW? Amazing, good on you. Sorry I have been absent for a while. Technology issues and school holidays. Miss all you guys!!!!! Oh my goodness this blanket is FABULOUS! I love rainbows and yours is perfection. What a beautiful job. oh it's absolutely gorgeous! the colours are so cheerful and it looks soft and comfortable. i'm glad the lil one seems to be doing better. i would too, with such a lovely blankie made with love to snuggle up in. Rainbow or geometrics...gorgeous it is! That is amazing!! Love it - well done! Mummy to Eggy and Minnie, wife to Pops. Joyce loves making stuff, Joyce loves talking about making stuff, Joyce loves seeing other people making stuff too. Joyce loves Pops, Eggy, Minnie, and Joyce loves Chocolate. Joyce Loves To Hang Out With. . . .
DeLysh » Blog Archive » Cooking Time!